I’m kind of funny when it comes to skincare. I am not one for trying very many new products, if I find something I like then I stick to it. I’ve been using Liz Earle Cleanse and Polish since I was about fourteen, and since it works I stick with it. However, recently because I haven’t been able to get hold of my usual products I have decided to try out some new bits from the drugstore. And I am totally loving them! I don’t post often about skincare or makeup, in fact I don’t even have a category for that any more on my blog, but I was reading through some posts on my twitter feed the other day (@misszarabelle) and I got a sudden burst of creativity and wanted to share them with you guys. 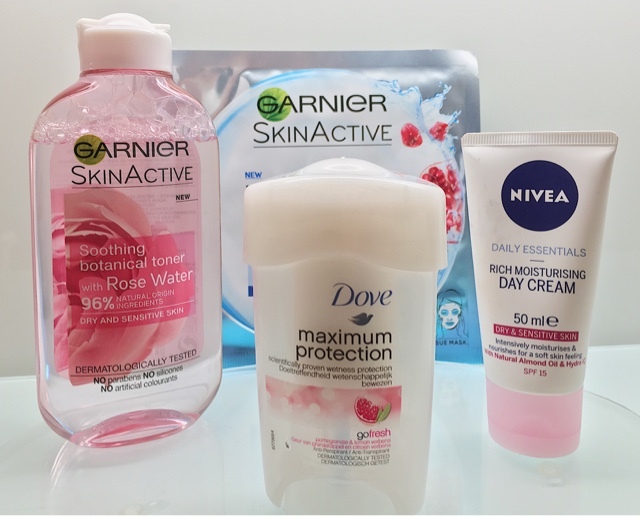 The first item is actually a toner that I was inspired to pick up after reading Jade’s review, check out her blog here! It’s the Garnier Soothing Botanical Toner with Rose Water. I am so bad for forgetting to use a toner and initially was only looking for one with a spritz to try and make myself more likely to reach for it. However this one is so beautiful and hydrating and I definitely think has made a visible difference to my skin. I was a bit worried about it being perhaps too hydrating as my skin was very congested recently but it has totally helped clear that up and it smells incredible too! Rose scents can sometimes be a little sickly but this one is just the perfect balance! The next thing isn’t exactly skincare, well, I guess it is just not facial! If it’s weird to write on the internet about a deodorant then I’m sorry, but this is most definitely the best deodorant I have ever tried by a loooong margin! TMI, but I definitely get a bit sweaty sometimes and have always struggled to find a deodorant that is strong enough without feeling disgusting and smelling like a chemical factory. For being a bridesmaid, my mum actually picked this up for me and it was an absolute life saver, as Scotland just happened to be having a freak heatwave the week of the wedding. Dove Maximum Protection in the scent Go fresh, pomegranate and lemon which is so fruity and nice! You basically twist it up two clicks per arm and that’s you done. You can put this on at night and it even lasts through a shower the next morning! It is some seriously impressive stuff! 100% recommend! Next we have the Rich Moisturising Day Cream from Nivea! Now I’m not normally a big fan of Nivea skincare, it normally irritates my skin which can be very sensitive sometimes so I normally steer clear. The lip balms and the hand creams just cause riots with my skin. However I was desperate one day and picked this up from Superdrug and it’s actually lovely! It does say it’s for dry and sensitive skin and it is pretty thick so I wouldn’t go for this if you have oily skin. It does leave my skin feeling very moisturised and you actually don’t need to use much to cover your whole face. It seems to also be a good base for my makeup and is significantly cheaper than my normal moisturiser so I am definitely going to pick this up again. 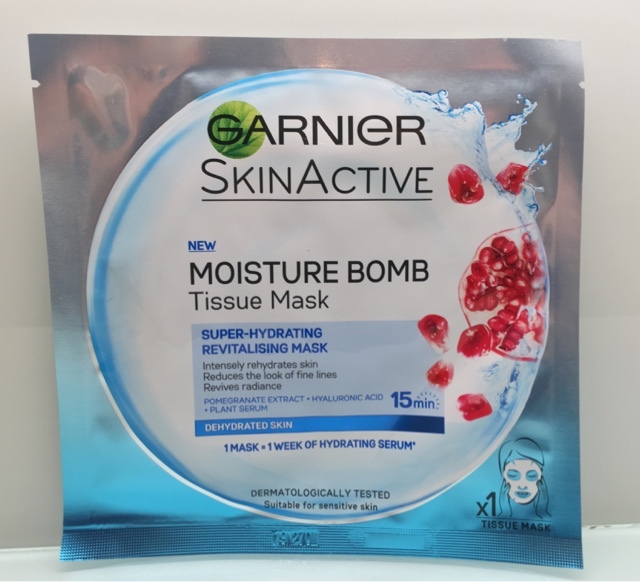 And finally, since sheet face masks are absolutely everywhere, I picked one of these Garnier Moisture Bomb Tissue Masks up on a whim a few weeks ago as they were sitting temptingly at the till! I can’t even describe the change in my skin overnight. 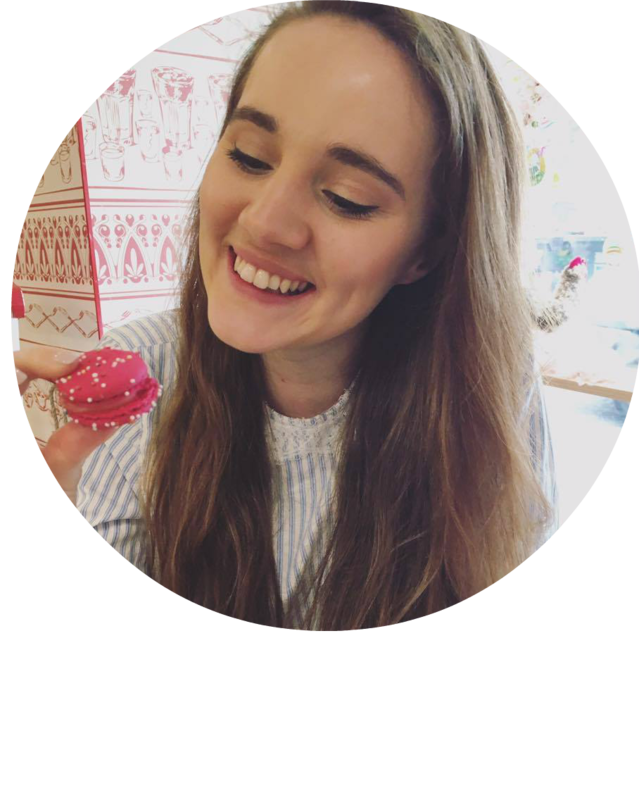 All my dry patches were gone, and even the little patch of eczema on my face was no longer red and itchy! It definitely is a little slimy and very wet but I have to admit I love it. It is so cooling and hydrating, taking fifteen minutes out your day to sit with this on your face is an absolute pleasure. My only issue with them is they always seem to be out of stock in my Boots when I have gone to pick more up. They are around the £2 mark which I guess is pretty pricey for something that’s only one use, but one of these a week is enough I think. Have you added anything in to your skincare routine recently that you are loving? I’ve been using these products for about 2-3 weeks now and am seriously impressed. Let me know in the comments if you’ve ever tried any of them! Hope you are all having a great week!